Puzzle Pirates Forums - View Thread - Pull Out's Intent for War with Black Flag! Forums » List all forums » Forum: Emerald Parley » Thread: Pull Out's Intent for War with Black Flag! 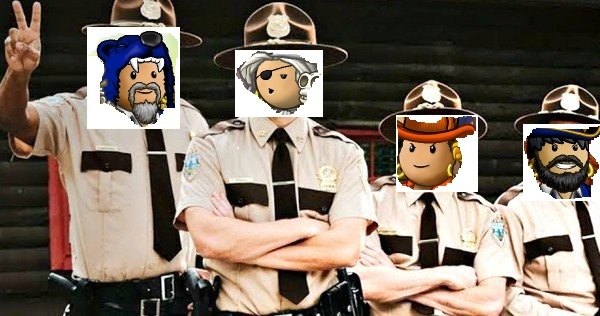 Today, we have some hype af news coming to you from your local highway patrol team. Whats coming? Well, this is simple, Pull Out is prepared to contest a 9,999/Seg Sinking war with Black Flag as long as they are prepared to! Why? It seems quite clear nobody is prepared to contend against the flags holding larges at the moment, which is completely understandable considerring the wealth of those mentioned. What we hope to achieve out of this, if not just plenty of fun for all involved, is that both BF and ourselves spend enough resources in this war that whoever comes out on top shall be weakened and enough poe will be spread out amongst the ocean that hopefully it attracts more action! So when/where is this all going downnnnn? We have decided to post this intent for war 7 days ahead of time so that BF has ample time to prepare and anyone who wants to come along to enjoy the show can clear their schedules! This means the first blockades of this war will be dropped for NEXT Saturday Noon GT! We will give Black Flag the oppurtunity to drop on Caravanaserai next Saturday Noon GT and we will not counter so that they can properly contest the island they didn't defend against us - if however they don't drop on Cara we will be dropping on Kent to guarantee some action for everyone! Island Plans? During the campaign with BF we will set all Medium and Large island taxes (excluding Admiral) to 0% and will be buying a majority of our cade stock dock side to finally give shoppe owners of these neglected islands some traffic. We'll be hosting several weekly events to try and bring hype to this large scale event, so make sure you spread the word with friends! More details to follow! Im happy to see that there is a flag left on Emerald that actually likes to blockade. Good luck Pull Out! Here to fight the bully flags and side with the smaller ones. If we wanted to shield Admiral we would've scuttled it, anyone was welcome to drop in at the time SR did or attack one of our other 5 islands at anytime they wished. Your not that good and would of probably lost the island to a BK . Are you a do-er or a talk-er? Thanks everyone for showing up! GGs BF for putting up another good showing! Black Flag would like to thank everyone that came out to support us for our blockades over the past couple of weekends. Without amazing jobbers, we couldn't have contested at all. I would personally like to thank all of the Black Flag staff, friends, allies for their contributions as well. I know many of you gave up plans to be here for us to try to defend our islands (hopefully nobody is in too much trouble with the family). Thank you also to Pull Out and their staff for such well contested blockades and we hope that you are able to continue with your desire to blockade in the future. Thank you to everyone who came out the past few weekends. Special thanks to PO members, allies, and supporters that came from all over. We also appreciate Black Flag for contesting. The hopes were that Black Flag would be willing to contest a few more weekends of max pay blockades to get some poe out to the ocean and the jobbers, but we understand BFs position in this. Hopefully, well be able to discuss terms for future blockades with BF and other flags on the ocean. The blockade on Isle of Kent was meant to get blockades from BF and the counter on Admiral made it exciting, so thank you. "We will be taking the wardec down on our end this week when we are able (Sorry Gulf)". All good. Be cool. I'll find the way. Cheers !